The main characters of the fairy tale "Pinocchio"
In the Russian and foreign fairy tales all the characters are intentionally divided into solely positive and negative. It is so small the listener easier to understand the difference between good and evil, right and wrong. The most popular Russian fairy tale character is Ivan the fool, however, not always this way represents only positive traits. In the tale "Ivan the peasant's son and the miracle Yudo" the way Russian Ivan presents the most beautiful and unique. Hardworking hero fights with a sword and bare hands, the cunning and ingenuity with monsters that have flooded the Russian land. He is kind and handsome, brave and courageous, strong and clever, this is undoubtedly the most positive image of Russian fairy tales. The other Ivan in "the Tale of Vasilisa the Golden spit" also saves all the people and their loved ones from a terrible serpent that has captured Russian beauties and his sister. Ivan the Pea – a strong and formidable hero, ready to repel any evil, to defend the homeland and defend the honor of the sisters. But in the tale "Ivan Tsarevich and the grey wolf" a more positive character speaks wolf, Ivan was just lucky to meet such a loyal and devoted friend. The same trend can be observed in fairy tales "KONEK-Gorbunok", "pike" and many others. Russian people believed that "the leopard change his spots", so Russian fairy tales are not typical of the transformation of the hero from a negative character into a positive one. 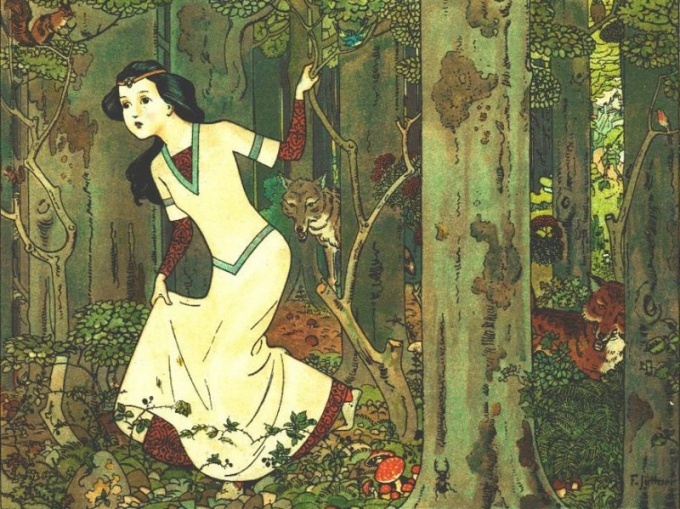 The most positive female characters in Russian fairy tales are Vasilisa the Beautiful and the wise. Russian beauty in the first place is intelligence, and kindness, she helps her chosen to defeat the evil cunning and wit to get a magic item or sends his wise Council. Oddly enough, some fairy tales may be positive even Baba Yaga, which supplies the traveler with parting words, ancient knowledge, and provides financial assistance in the form of magical items: a handkerchief, a comb, a ball of yarn or a mirror. Heroes of European fairy tales are fundamentally different from Russian, they are weak physically, intelligence and cunning in them, not glorified as in Russian folklore. In the first place come such qualities as kindness, obedience, love and hard work. Snow white and Cinderella – hammered beauty, born for love and luxury, but, by the will of evil men, they must play the role of maids. They don't make any effort to change their fate, they are submissive to her and freed from the shackles only by chance. And the main idea of these tales is the idea that justice is a necessary virtue and hard work, and God or the good fairies will reward the heroine for all the hardships. Pinocchio – the tale of the Italian writer about the transformation of the silly, naughty and sometimes cruel wooden doll in a kind and caring boy. Pinocchio or Buratino one of the most positive children's characters. Warrior heroes in foreign fairy tales are quite rare, one of the few such characters is considered a soup, although this is more the image of a revolutionary, fighting against the bourgeoisie dictators and slavery. Of special note is another goodie, a medieval revolutionary Robin hood. The collective image of the noble robber-warrior romanticized and spiritualized. He fights against evil in the face of cruel feudal lords, with lawlessness and injustice. The Eastern tale in their ideas closer to the Russian, for example, Aladdin is the analogue of Ivan the fool or emeli. The Eastern characters, like Russian, often help cunning, dexterity and resourcefulness, the most popular hero – "the thief of Bagdad", a criminal who has managed to cheat dozens of bags and was never caught. In almost every Arab tale is present and guiding hand – as in the Russian tradition, is a woman. Clever and cunning Ali Baba's wife, Sakina, Scheherazade, like Vasilisa in Russian fairy tales embody such intelligence and wit that is inherent only to women.